So it's the feather head episode. This episode... I'm always glad to put it behind me. I think Voyager has one of the strongest (maybe the strongest) freshman season of any Trek but there are still bumps in the road and this was always one of them for me. SITREP: Tom Paris has seduced a feather head lady with a yappy dog and then apparently killed her husband (a prominent scientist) in a jealous rage and has already been tried and punished at the commencement of the episode. His penance: Every 15 minutes Paris must relive the events of the murder through the victim's eyes. 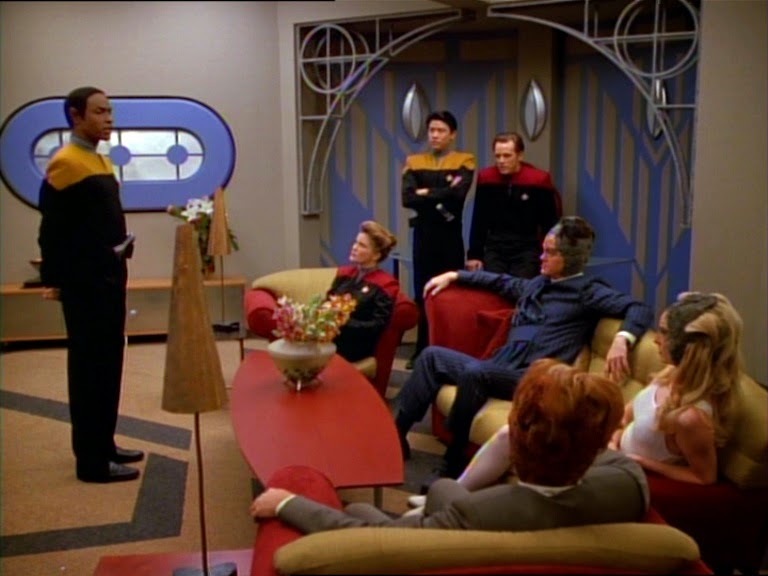 Janeway is out to prove his innocence so Detective Inspector Tuvok takes the case. Eventually everything is ok again. Here, I think, is my biggest issue with this one: It's just Riker. They've been hammering how rakishly Riker Tom Paris is since the pilot episode but I just don't buy it. I buy that Paris is a cocky scofflaw with a bad-dad-flavored chip on his shoulder--I just don't buy that he has "five girls back home" or that he seduces vapid, feather headed housewives wherever he goes. Not only does McNeil not really sell the sexual swagger and confidence the way Frakes did but the whole idea of it doesn't really feel fresh or interesting at this point. Maybe that's because the entire premise for this one was a Riker-sode in TNG. In "A Matter of Perspective" Riker presumably murders a prominent scientist after seducing the man's wife. Data and Geordi take the case and then evidence is brought against him using the holodeck (rather than a mind meld) and he's eventually cleared of the charge. Of course the ole' "I definitely did not murder that guy/gal!" episode goes all the way back to when Scotty murdered a belly dancer but then actually it was Piglet/Jack the Ripper. Even Dax is put on trial for a murder involving an affair in "Dax." So, again, this is an episode that any Trek could have done and did do and if there was another Trek on right now it'd be a first season story. It's not that there's anything inherently wrong with it. It's just that there's not much going on here that makes it feel special and unique and Voyager-ish. -There's a really nice conversation between The Doctor and Kes about personhood and a hologram's ability to make his own choices. -Using Maquis tactics to evade Delta Quadrant aliens is nice idea. -Tuvok Holmes is fun to watch and I'd totally watch that spin-off. -The added twist of "really Paris is being used an unknowing carrier of information for a spy" isn't a bad idea. -Neelix has no clue what a mind-meld is. I find this absolutely awesome and hilarious. Nice touch, people. Give yourselves a pat on the back, whoever thought of that. A Tuvok Holmes spin-off would rock. Heck,pretty much any Tuvok spin-off would rock. KJ! I've missed you! Yeah, I sometimes feel like I'm too hard on this one. It's not like they're doing anything awful and the investigation is actually an interesting change of pace. Still, I wish it hadn't been quite so much like TNG's "A Matter of Perspective." You know, I should do another portrait series! I've done a lot of art since then and I have a lot of new readers! Let's put one on the books for this Spring! Then you can be re-drawn in uniform! I really enjoyed the Maquis battle tactic too. Janeway shows a lot of respect for Chakotay in these early episodes. I find myself believing their chemistry way more now than I ever did when I first watched Voyager.